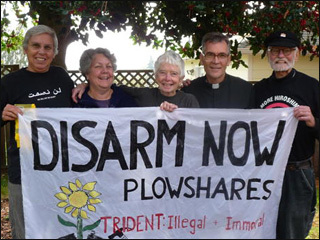 Our friends who took part in Disarm Now Plowshares last November were indicted by a federal grand jury on Friday and will appear in U.S. District Court in Tacoma for arraignment on September 24, 2010, at 1:30 p.m. If the five activists are found guilty on charges of “conspiracy, trespass, destruction of property on a naval installation, and depredation of government property,” they could each face up to 10 years in prison and a $250,000 fine. …they entered Naval Base Kitsap-Bangor in the early morning hours of November 2, 2009, All Souls Day, with the intention of calling attention to the illegality and immorality of the existence of the Trident weapons system.